The Eisenhower Dollar, designed by United States Mint Chief Engraver Frank Gasparro, honors our 34th President, Dwight D. Eisenhower. At the same time, it recognizes the first landing of a man on the moon on July 20, 1969, which was a significant step forward for mankind. The reverse of the coin features the Apollo 11 mission insignia, which shows an Eagle with its wings spread coming from Earth and landing on the lunar landscape. The Eisenhower Dollar was minted for just 7 years, from 1971 to 1978, so finding specimens in"Brilliant Uncirculated" condition has become increasinglydiffucult. We were able to acquire a limited supply of these highly sought-after coins from the final year of production. These important pieces of American coin history have been preserved in our Numishield Archival Case to protect them from scratches mand the damaging effects of dirt and oil. 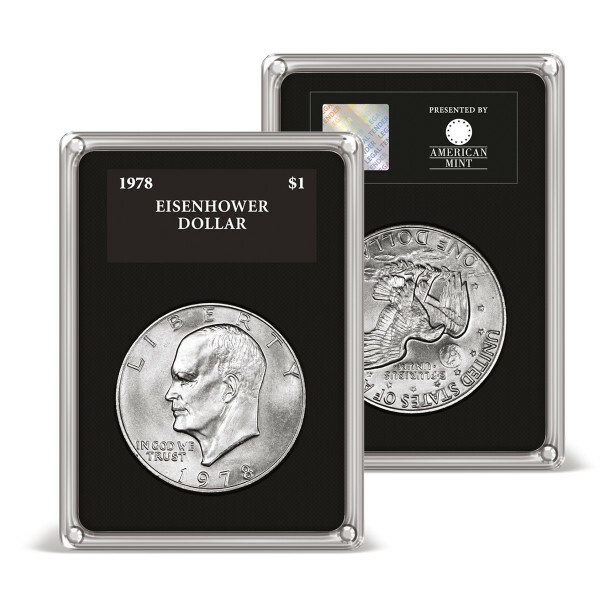 The case bears the exclusive American Mint holographic label and includes a Certificate of Authenticity.